Computer users have multiple options when it comes to combining images. They can use a photo editor like Paint.net or Adobe Photoshop to load the images to create a merged image, use online services or specialized tools like Sprite Sheet Packer. The main advantage of the latter being that its operation requires no deeper knowledge to combine the images. Combined images can be useful in several ways, CSS sprites come to mind. This is a technique were multiple images are combined together to reduce the number of http requests of the user effectively reducing page loading time. But it might also be helpful to send someone a pack of images merged into one image instead of dozens of single images. 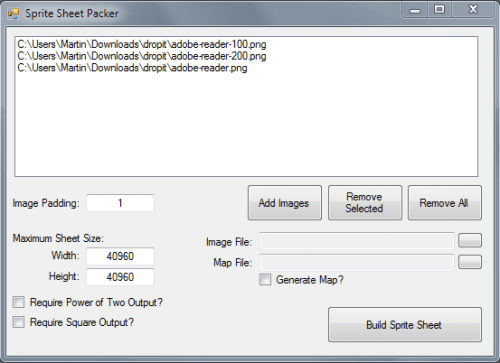 Sprite Sheet Packer is a portable program for Windows. Images can be dragged and dropped into the interface or added from the internal file browser. Supported are PNG, JPG, BMP, and GIF images, the output image will always be a png. All images that have been loaded are displayed in the upper area of the interface. The lower area contains several parameters that define the output. It is here possible to configure the padding of the images and the maximum size of the resulting image. The maximum size depends largely on the computer system. It will also determine the size of the merged output image. The image merger furthermore generates a map file defining the coordinates of each image in the combined image, helpful for CSS sprites as these coordinates are needed to load the images properly on a website. Sprite Sheet Packer is available for download at the software's Codeplex project website. May require Microsoft .net Framework, but not sure about that. Previous Post: « PDF Reader Rendering Quality Comparison, Which Is The Best? NIce find Martin. This will sure come handy. Yep it is nice and straightforward, good program to create CSS sprites. Only prob I had with it is that it does not align the images in sequence. Its broken. Cant even do 100.pngs @ 1920×1080 25fps. Garbage.